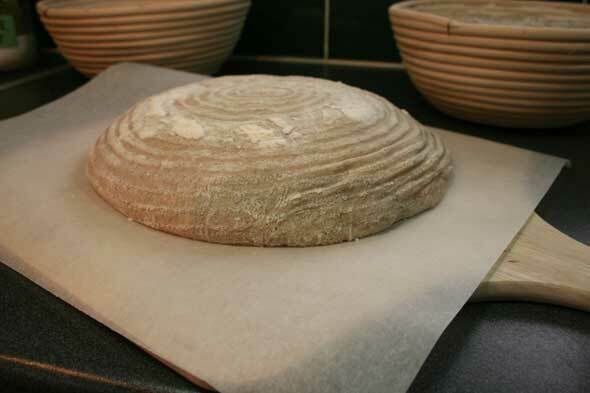 This bread uses a sourdough build, so let’s have a look at that first. The recipe calls for “High Extraction Whole Wheat” but of course, there’s no such thing in my neck of the woods so I improvise and sift the bran out of normal 100% Whole Wheat. . There’s also whole Rye (got that) water and the salt for the whole loaf. Because this will stay on the counter for a bit longer than the required 12 hours, I added about 1/4 of the salt to slow down the sourdough yeasties. The rest will go in the main dough later. This levain is left to mature for 12 hours, overnight and the next morning has grown to about double the size. 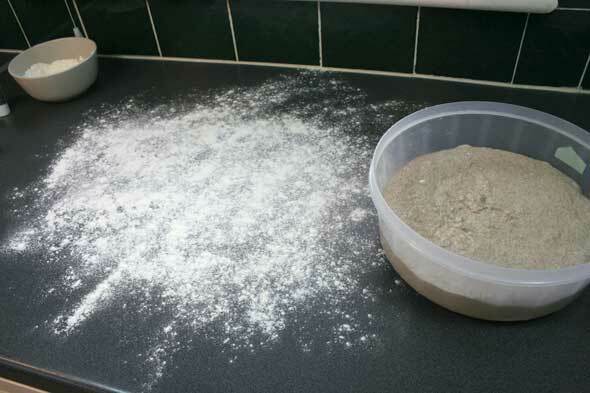 The full dough Mis en Place: the levain, sifted whole wheat, water, the remaining salt, bread flour and whole rye flour. 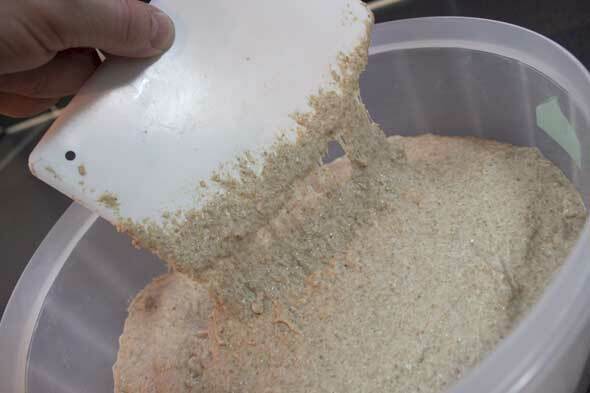 The different flours and water are combined and mixed very shortly until they basically come together as a “shaggy mass”. 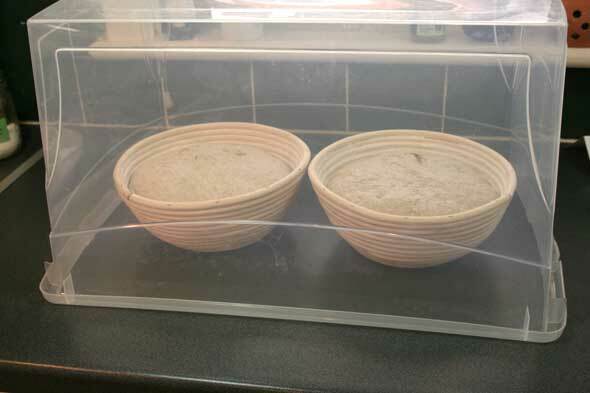 The dough is then rested for a 20-60 minute autolyse to absorb the water better (I did 30 minutes), then the salt is sprinkled on top and the levain is divided and put on top of the dough. 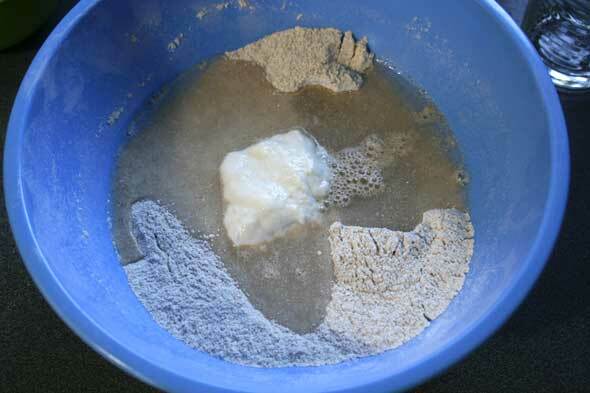 The dough is then mixed for 2 to 2.5 minutes and transferred to a bowl to begin it’s bulk ferment and Stretch & Fold process. We’ll be doing three folds at 40 minutes apart. 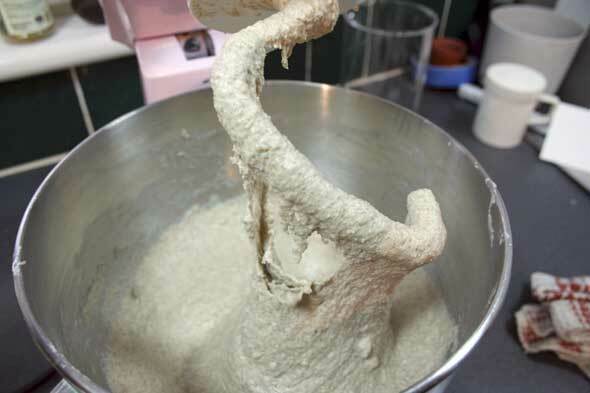 I can’t help but note that this dough is really wet. 82% hydration, according to the recipe. Boy, I hope the S&Fs make this a little more workable because at the moment, it looks like plain goo. 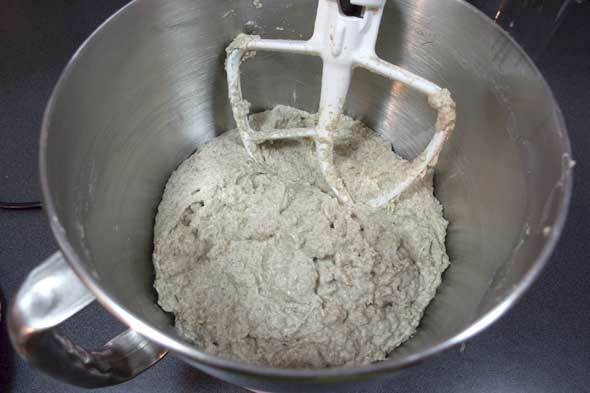 After the first 40 minute bulk proof, I turn the dough out onto a very generously floured counter. I also have, off to the side, a large bowl of water for my hands and plastic scraper. With some difficulty, I manage to stretch out what seems like goo out into a large rectangle and do the required Stretch & Fold steps. 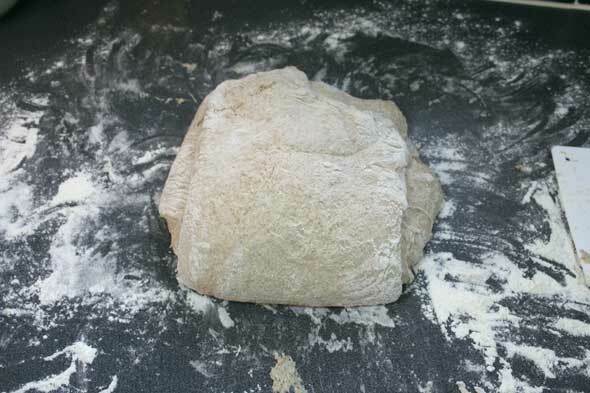 I finish up the third fold and feeling the dough is so unstructured, I give it a second quick S&F right away. It gets folded up once more and popped back into the bucket for 40 more minutes. I didn’t have photos of this because my hands were full of sticky dough and also because it will look pretty much just like the steps above, but at the second 40 minute mark, the dough had improved considerably. 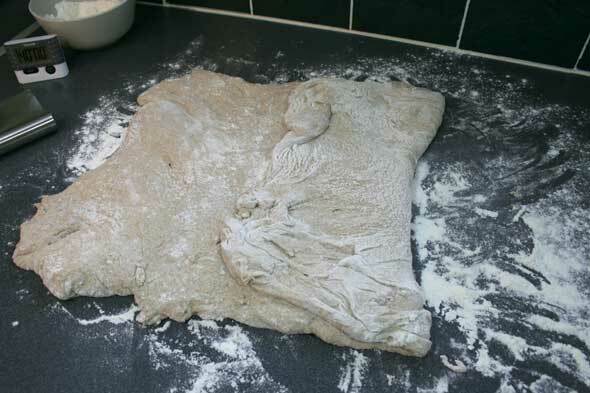 There was gluten development going on the the dough felt “whole” and not just a pile of wet flour. Another 40 minutes and the third and final stretch occurred and the dough felt even better this time around. 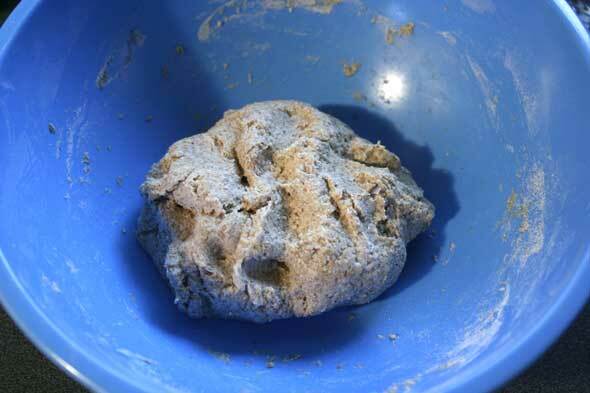 I put the dough back in the bowl for the last of it’s 40 minute rest before shaping. The improvement in this 82% hydration dough was rather amazing. In spite of the nice dough texture, shaping it was a bit difficult because it’s still rather sticky dough so I didn’t get photos with my gummy doughclaws. 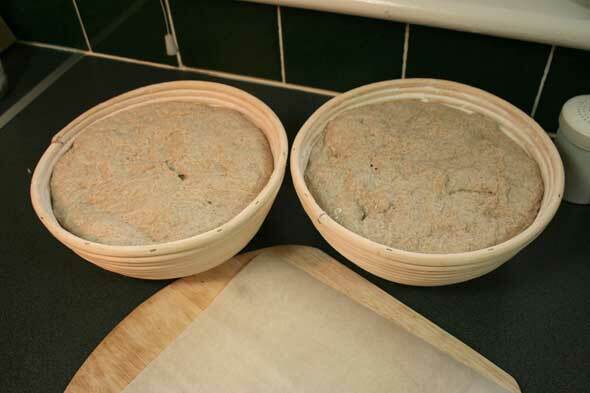 But there are the two 840g or so boules, plopped into the floured brotforms. They are to sit out for 2 to 2.5 hours to proof. After about an hour, they had reached pretty close to the top of the baskets. Although it seemed to me they may have been OK, there was still one to one and a half hours left to proof, so I let them go further. I cranked the oven up to 440ºF and set my pseudo-baking stones in (unglazed porcelain tiles) and a pan for steaming. At about the 2 hour mark, I checked the dough again and gave it a little of the poke test: if it bounces right back, it’s underdone. If it stays fully indented, it’s overproofed (too late!) and if it fills back about halfway in a few seconds, it’s just right. So I poked and the slight dome of the dough in the baskets begins to cave in slightly. Damn, over-proofed and the structure is giving up. 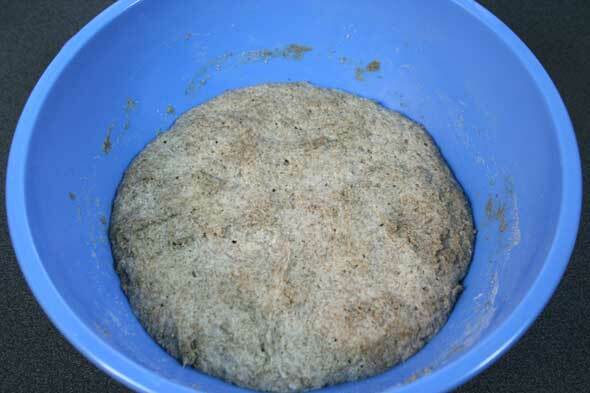 Well, it is an especially hot day (27ºC or 80ºF) so the dough was probably ready a half hour before, but the stove wasn’t. Well, no sense stopping at this point, so onto the peel it goes. Now I know this bread is supposed to be ‘flat’ but it was very flat. I’m hoping at this point to get some oven spring so I don’t have two really thick pita breads. To score or not to score, if I do, I might deflate what’s left of the bubbly dough. Oh well, let’s throw caution out the window. I make an attempt at pretty slashing but the dough is really soft. You’ll see the results in a bit. Into the 440ºF oven it goes. The book says a total of 75 minutes but these are so low profiled, I doubt it will take that long to cook up the middle. So I check at about the 30 minute mark (I didn’t bother to reduce to 420º) and they had both reached 195ºF inside. Good enough. Out they came. And there they are. How much oven spring? Just a little. But they looked a nice colour and smelled wonderful. 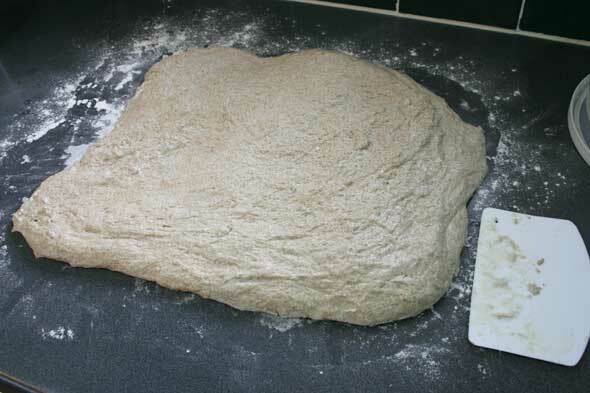 The slashing didn’t spread much because they dough didn’t get to expand much at all. The pattern was “ok’ at best because I didn’t want to specifically cause total deflation. The bread is put on a rack to cool for 12 hours, says the book. HA! says I. One hour and they’re at least still a bit warm. 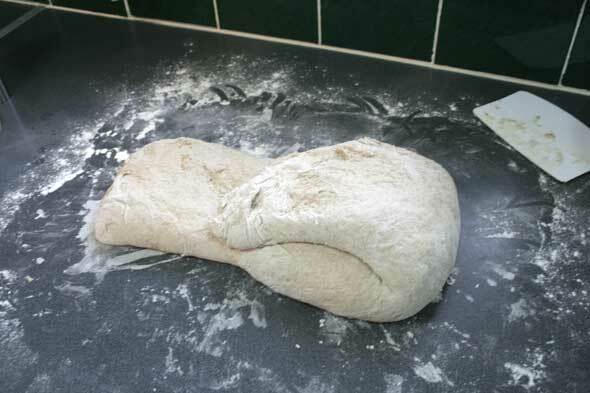 As you can see from the profile, this is a very “low slung” bread. However, the crumb is very holey which I didn’t really expect since I thought the gluten structure would have totally collapsed. I was pleasantly surprised by that. Taste: Wow, nice! A lovely combination of flavours here, the crust is (this soon out of the oven and un-bagged) still somewhat crunchy but not too hard, and not thick. I quite like this bread. If not for the too-warm kitchen issue and over-proofing, this would have been a top marks bread for me. Everything else is really nice about it. So this one needs to go into the “Do Overs” pile. And in spite of it’s slight flatness, it’s going to be YeastSpotted. Next: Deciding on Corn Bread or Grissini for next weekend! Want to join us as we bake all the breads in Hamelman’s Bread: A Baker’s Book of Techniques and Recipes? Hop over to MellowBakers.com! Start in at any time, pick up where ever you want! We’re mellow! I think it looks beautiful and sounds delicious! 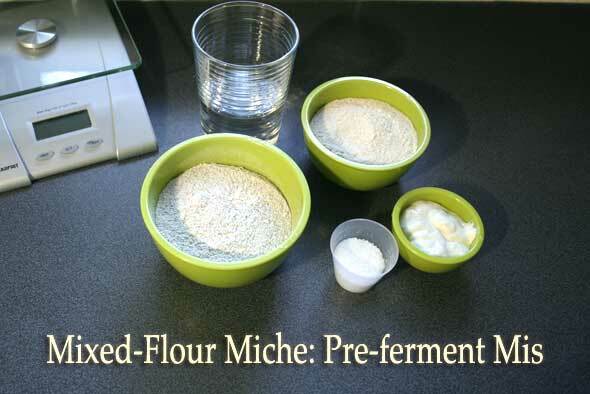 My BBA miche was very poufy and therefore looked quite un-miche-like. Maybe I’ll have better luck with this dough! .-= Abby’s latest blog post: Mellow Bakers: Grissini (May) =-. Nice loaves and thanks for the detailed post. .-= Ulrike’s latest blog post: Bagels für die Mellow Bakers =-. 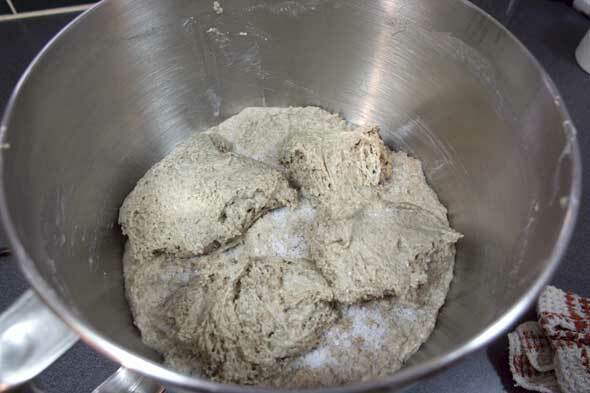 Looks lovely, but is this the pointe a calliere or the mixed flour miche you have made? Or are our books different on this one? Mine only has whole wheat flour in it? These print runs are Soooo confusing. I like your proof box for the dough! Never thought about it but it sounds convenient. Oh fer pete’s sake… How did I not notice that?? I even had to rewrite all the weights in grams that I had calculated days before. Duh!!! 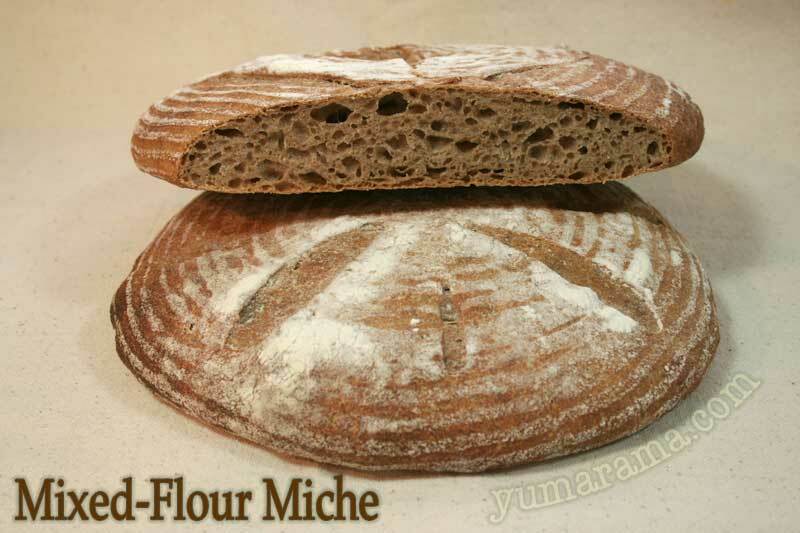 Yes indeed, looks like I flipped from the Pointe Miche to the Mixed Flour Miche on the next page at some point early on. Time for a bit of editing! I love the crumb and the beautiful daisy slash! I also had flipping issues with this book. I now attach [low-stick] tab markers between the pages while baking. .-= Oggi’s latest blog post: Dining with Sherlock Holmes =-. 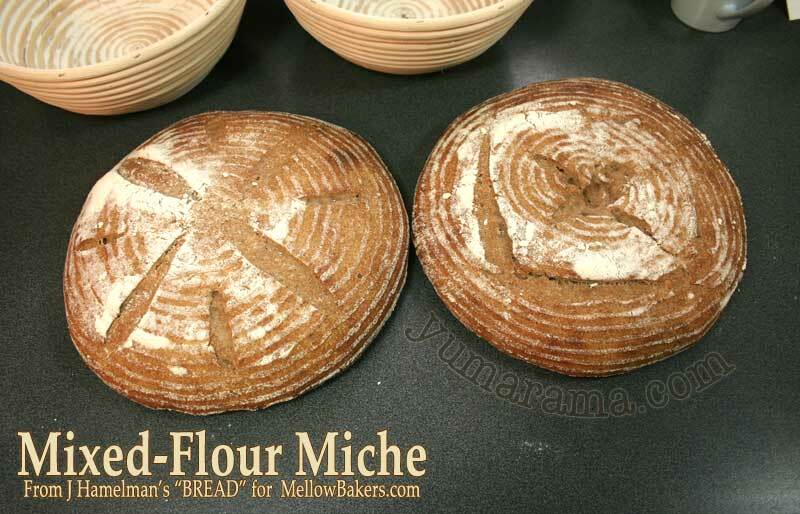 I have just hauled a half miche out of the oven and even without the rye component it is pretty flat! I reckon if I’d made the full monty then it would have slid off the bread stone before it jumped up. I’ll do a post later on. I too have had flipping issues and formula misreading moments with this book. I think it is to do with the colour of the print and the page and the way all the pages look the same and the way the recipes are laid out over two sometimes three pages. It all blurs a bit. I have one of those plastic boxes too that I use! But over the bannetons I usually use cheapo plastic shower caps which you can throw away when the elastic gives out! Paul – loved the post. 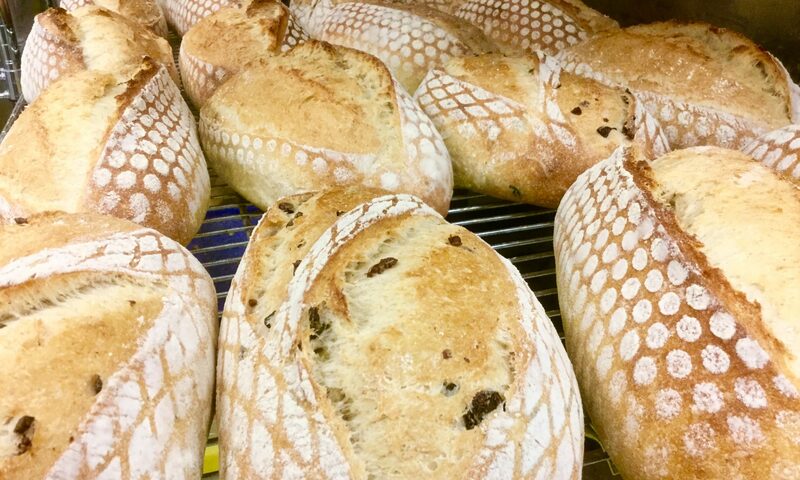 One question, or maybe even quibble: salt slows down sourdough? I am totally in agreement when it comes to yeast based doughs, but i was under the impression that real sourdough likes a slightly more acidic setting, and that salt helps to get it there. …or, it could be that I am full of b.s. Your thoughts? 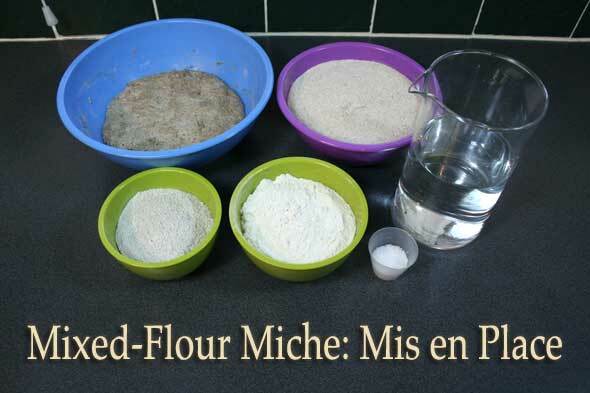 This is the last line of step #1 in his both miche recipes on page 164 and 166. I personally can’t attest one way or another whether this is totally accurate since I’m but a lowly occasional home baker who does a loaf or two every weekend or so, therefore I don’t have the opportunity to experiment on endless amounts of dough as a baker in a bakery would. (I wish I could!!) 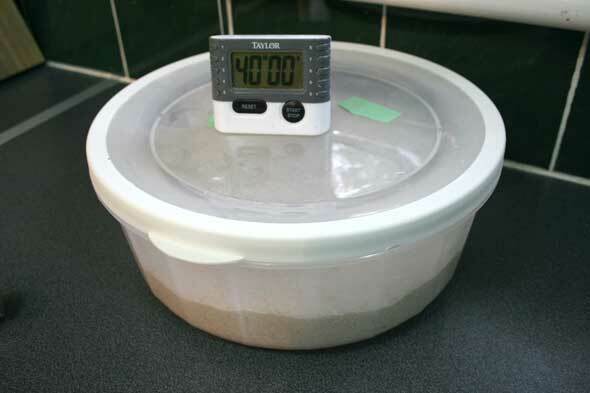 So like you, I have to rely on those who can test loaf after loaf, tweaking this and that and checking the results almost instantly and can tweak and trying again a half hour later. So I guess I’m just going by “faith” that Hamelman is correct, and the fact many of the top dog home bakers on TFL seem to hold this as true too helps confirm it is likely correct. Salt inhibts yeast activity and, it seems, it doesn’t matter too much if it’s wild or commercial yeast. I’d often heard getting any salt on your commercial yeast basically kills it on the spot but it seems even that is wrong. So what is “common knowledge” isn’t necessarily fact and it’s good to question this stuff. And if I may be allowed to indulge in a horrible pun, you may take even “reading it somewhere” with (sorry, sorry!) a ‘grain of salt’. It’s good to question and get differing opinions on even “straight facts” like this because, as the old song goes, “It ain’t necessarily so”. If I am going to be cereal for moment, (oh, come on!) I would state that in general I consider both you and Hamelman as authorities. In fact, if you did not confess to being ‘but a lowly occasional home baker’, no one would presume otherwise! There is no question in my mind that salt slows yeast dramatically. I have actually tested that theory and gotten repeatable results. Granted, as home bakers, we don’t really have a clue what type of yeast or bacteria we are culturing in most sourdough. I have read that many sourdoughs, like the Amish friendship starters, are commercial yeast cultures with wild yeasts added over the years. 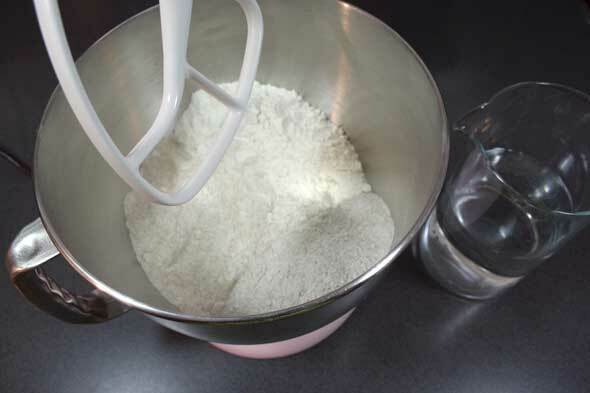 I got started in this whole baking scene because I read that true lactobacillus sourdough was easier on a diabetic’s blood glucose levels, since the bacterial leavening produces lactic acid as opposed to sugars like most yeasts. This is backed up only by my home experience and is certainly not clinically tested. and, as it turns out, even lactobaccillus starter is in a symbiotic relationship with specific acid friendly yeasts. 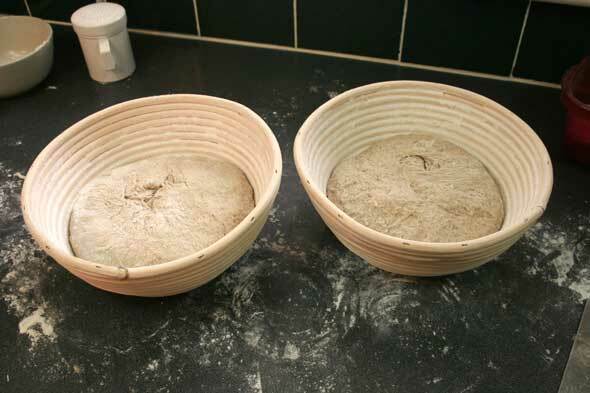 But then, the same claim applies to rye flour, as opposed to wheat flour. My starter seems to thrive on it; but I am just too cheap to use it all the time. Thanks, Paul, keep up the good work. I am learning a lot. I intend to make this next weekend (May 15th), as my H-U-G-E banneton should arrive by then…. .-= SallyBR’s latest blog post: HERB AND MUSTARD PORK ROAST =-. I’m surprised by the holey structure, too. Will see, how mine turns out. Oh wait, what did you say? End of 2011? I think you’ll have to repost this so we can compare our breads to yours ;o). .-= ap269’s latest blog post: Mellow Bakers May 2010: (1) Grissini =-. Previous PostPrevious When good bread goes a-rye.